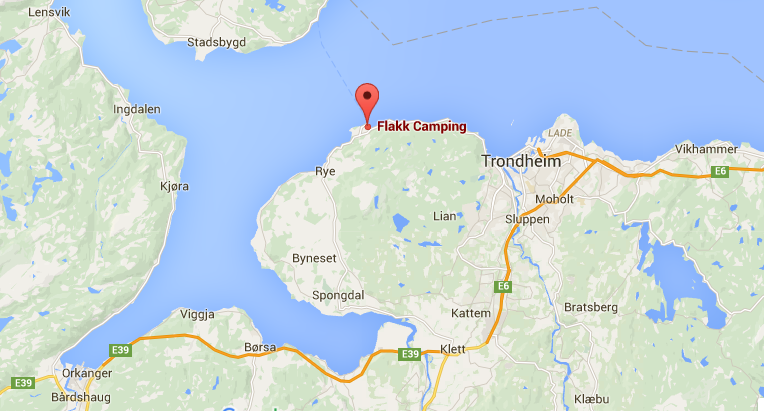 Only 11 km west of Trondheim you find Flakk Camping, idyllically situated beside the Trondheim Fjord. Here you have access to the beach; you can fish from shore, and go hiking in a great hiking terrain nearby. From the campsite, you have a wonderful view over the fjord, where cruise ships and Hurtigruta pass close by. The proximity to Trondheim makes it easy to visit the city, where you will find a variety of sights, cultural events and activities. It is easy to drive, cycle or go by bus into the city centre. Flakk Camping is also a great base for cycling trips around Byneset, where you will find the region’s largest golf course. (Cars and cyclists share the same road). We welcome tents, caravans and motorhomes/campers. In addition, we have four small cabins for rent. The cabins are equipped with hot plate, refrigerator and basis kitchen utensils. All our overnight guests use the sanitary facilities and shower without extra costs. Pizza, burgers and snacks is available from Flakk Pizza & Grill. In the village of Rye located about 4 km / 5 minutes by car from Flakk Camping, you will find a grocery store and gas station. Northbound travellers: If you travel northbound on E6 or westbound on E39, take off on road 707 towards Byneset / Fosen in the roundabout on Klett. Follow county road 707 until you reach Flakk. The exit to Flakk Camping is on the right hand side just before the ferry port. Southbound travellers on E6: After Grilstadtunnellen, follow E6 around Trondheim citycenter (towards Oslo): Take the right lane to get out on road 706 towards Fosen via Steinberget tunnel. Take then the county road 715 towards Fosen. It takes about 25 minutes to drive to Flakk Camping from the northern borders of Trondheim. Travelers from central Trondheim: If you drive through downtown Trondheim, follow Sandgata out of the city centre. Follow the signs to Byneset / Fosen. The exit to Flakk Camping is on the right hand side just before the entrance to the ferry port.